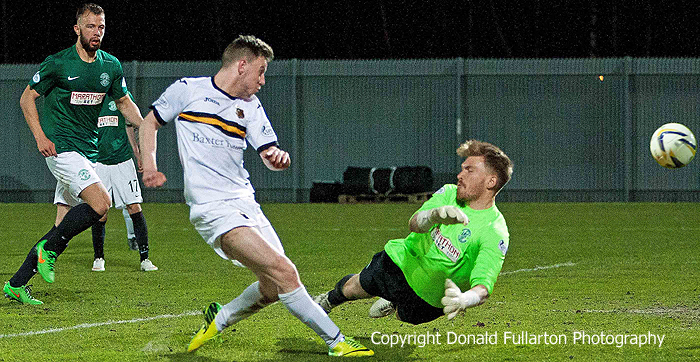 DUMBARTON battled play-off hopefuls Hibs all the way in a fascinating evening game at the Dumbarton Football Stadium. DUMBARTON battled play-off hopefuls Hibs all the way in a fascinating evening game in front of a 700 crowd at the Dumbarton Football Stadium. The visitors, with midfielder Scott Allan their driving force, had slightly the better of a first half in which both sides had chances. A theatrical fall by Liam Craig with not a Dumbarton player near him conned referee Craig Charleston into awarding an early penalty to Hibs, but justice was done when keeper Danny Rogers dived full length to his left to push the ball away. As half-time loomed Hibs took the lead when defender Paul Hanlon headed home through a crowded Dumbarton penalty area. After the break it was the home side who took charge, creating chance after chance until the equaliser arrived. A rampaging run by defender Scott Taggart ended with a powerful shot which keeper Mark Oxley could only parry, and Mitch Megginson gleefully slammed the rebound into the roof of the net (pictured). But shortly after that came the turning point, when Sons midfielder Chris Turner was sent off by referee Charleston for over-reacting to a bad challenge, while the original offender was lucky to escape with a yellow card. There was no way back for Sons when Jason Cummings got on the end of Lewis Allan's pass and slotted home to make it 2-1.